Katherine Turner is a Ph.D. Candidate at the Natural Resources Institute, University of Manitoba. She completed her Master of Natural Resources Management degree in 2010. Her research centers on the use of biocultural resources for community economic development. Iain Davidson-Hunt is Professor at the Natural Resources Institute of the University of Manitoba, Member of the Canadian Institute of Planners and co-lead of the Theme on Sustainable Livelihoods, Commission on Environmental, Economic and Social Policy of the International Union for the Conservation of Nature. He has worked with Indigenous Peoples and Local Communities on territorial land-use planning, ethnoecology and biodiversity-based enterprise development. Annette Aurélie Desmarais is Canada Research Chair in Human Rights, Social Justice and Food Sovereignty at the University of Manitoba. She is the author of La Vía Campesina: Globalization and the Power of Peasants (2007) and co-editor of Food Sovereignty: Reconnecting Food, Nature and Community (2010), and Food Sovereignty in Canada: Creating Just and Sustainable Food Systems (2011). This paper examines reconfigurations of household economies and agrobiodiversity through the experiences and responses of rural households to local manifestations of globalisation and environmental change in the Central Valley of Tarija, Bolivia, from the 1950s to the present. Research participant narratives from seven study communities document a widely experienced regional shift from rain-fed agriculture and pastured livestock production for household consumption to market-oriented production of regionally-specialised commodities. Particularly important to this reconfiguration are changing land access and use regimes, household responses to changing opportunities, discourses and social requirements related with ‘modernising lifestyles’, market integration and dependence, changing environmental and ecological conditions, and greater availability of consumer goods and technologies. We analyse how these processes have combined to reconfigure the range of livelihood possibilities available to rural households, or their ‘landscapes of possibility’, in ways that favour transition to specialised commodity production. Patterns of change in household agrobiodiversity use, however, are entwined with threads of persistence, underscoring the contingent nature of rural transitions and the role of local agency and creativity in responding to and sometimes shaping how globalisation unfolds. Examining rural transition through the experiences of households in particular contexts over time offers insights for development policy and practice to support producers’ ability to respond to globalisation and environmental change in ways they see as desirable and beneficial to their livelihoods and wellbeing. Agrobiodiversity has sustained human populations worldwide for millennia; however, declining use and loss of local crop and livestock varieties over the last century is well documented and often linked with far-reaching changes in rural economies and ways of life (Orlove & Brush, 1996; Smale, 2006; Vandermeer et al., 1998; Zimmerer, 2010). Development trajectories leading to loss of agrobiodiversity through the expansion of monoculture and other low-agrobiodiversity systems and declines in smallholder farming are a dominant pattern that has accompanied processes of agricultural modernization and rural development agendas for decades. For rural producers who have remained in agriculture, sustaining, adapting and reconfiguring household agrobiodiversity1 over time reflects producer priorities, ability and creativity in responding to disruptions brought about by local manifestations of globalised change. Ability to respond to these changes is also shaped by how the biophysical, sociocultural, regulatory and economic landscape in which they are embedded configures access to (or the ability to benefit from) key resources (Ribot & Peluso, 2003). Davidson-Hunt and colleagues (Davidson-Hunt et al., 2016; Davidson-Hunt, Idrobo, & Turner, In Press 2017) propose the concept of globalised change, building on the work of Leichenko and O’Brien (2008), Zimmerer (2010) and others (e.g. Wolf, 1982), to describe the complex of disruptions facing rural societies around the world as resulting from combined, often simultaneous processes of globalisation, environmental change and historical legacies of past disruptions. Globalisation manifests in rural areas through agricultural modernization, intensification and market integration often driven by development agencies and national development projects, as well as through changes in social norms and consumption patterns (Akram-Lodhi & Kay, 2009; Rhodes, 2006; van der Ploeg, 2008; Zimmerer, Carney, & Vanek, 2015). Climate change and other environmental change processes are increasingly demanding recognition as defining structural forces determining future livelihood strategies, quality of life and economic possibilities in rural areas (Rhodes, Ríos & Aragundy, 2006). Regions, economic sectors, social groups and, consequently, households and individuals experience and respond to new or ongoing disruptions within historical material contexts already shaped by legacies of past disruptions, which can include colonisation, dispossession, and past development programs. In considering current and future impacts of globalised change on agrobiodiversity within household economies, we find it helpful to consider how the range of choices available to different actors are shaped over time. Bebbington (2008) proposes landscapes of possibility as a way of thinking about rural transitions and reflecting upon their outcomes for rural people. Landscapes of possibility directs attention to how landscapes, as constructed physical, economic and sociocultural systems, are produced over time through daily life and organized interventions that come together in ways that enable certain resource flows and facilitate some livelihood practices, while hindering others. Bebbington focuses on livelihood possibilities more generally; however, we narrow our focus to how landscapes of possibility emerged through local experiences and responses to globalised change to inform agrobiodiversity use and associated practices within household production systems. Through an empirical case study in southern Bolivia we examine how agrobiodiversity compositions within household production systems have changed during the living memory of research participants (c. 1950 to the present), why they have done so in particular ways and how these changes have been experienced by research participant households. While new crops and livestock have augmented campesino (peasant) production systems in southern Bolivia and elsewhere (Turner & Davidson-Hunt, 2016; Zimmerer, 2013), our discussion focuses on declining household production of pastured livestock (i.e. sheep, goats and creole cattle)2 and grain crops (i.e. quinoa, amaranth and wheat) as a dimension of local experiences and decision making related with shifting landscapes of possibility. We find that this reconfiguration reflects multifold processes of globalised change, including changing land use and access regimes, household responses to changing opportunities, discourses and social requirements related with ‘modernising lifestyles’, market integration and dependence, changing environmental and ecological conditions, and greater availability of consumer goods and technologies. Research participant experiences show how the interplay of diverse local and extra-local interests, goals and ideas sets the context, or landscape of possibility, in which some avenues, such as commercial production, are expanded, while other possibilities, such as the production of traditional livestock and crops, are restricted. For some households, changes in agrobiodiversity use and associated livelihood transformations have been positive in terms of income, livelihood stability and other factors. For others, however, transformations in ways of life were not made freely and are associated with feelings of sociocultural and economic marginalization. Understanding how individuals and households experience rural transformation offers insights into rural development policy and program outcomes (intended and otherwise), their interplay with environmental change, existing production systems and agrobiodiversity, and suggests conditions necessary to retain possibilities for local agrobiodiversity use into the future. Such reflections are of particular relevance in Bolivia where the country, through the 2009 constitution and subsequent legislation (Plurinational Legislative Assembly 2012, 2013; Plurinational State of Bolivia 2015), has committed to supporting new rural development pathways that respect cultural diversity, ecological limits and at the same time bring about improvements in quality of life for rural peoples. The documentation and analysis of household experiences of rural transition and change in agrobiodiversity and the complex of factors shaping these processes over many decades offers insights and points of reflection to support diverse campesino economies into the future. Tarija, the southern-most Bolivian department, borders Argentina to the south and Paraguay to the east. Crosscutting the eastern edge of the Andes mountain range and western lowland Chaco region, the department is comprised of multiple ecological zones, of which the Central Valley is the most populous. Situated at an elevation of 1750–2100 metres above sea level, the Central Valley has a temperate, semi-arid climate with average temperatures between 15–23 degrees Celsius and 500–700 mm of average annual rainfall (Prefectura 2006: 6). The region roughly corresponds to the municipalities/(sub-) provincial districts of San Lorenzo, Cercado and Uriondo and is home to the Departmental Capital, the City of Tarija (Cercado), in which half the 245,000 Central Valley residents reside (INE 2015). The majority of people in the Central Valley are Spanish-speakers of mixed European and indigenous descent. Historically, local populations relied on access to multiple ecological zones, trade between communities and multiple livelihood activities, including crop production, animal husbandry and wage labour, to craft their livelihoods (Preston & Punch, 2001). Migration to the City of Tarija, Argentina, and elsewhere is also a widespread, long-standing livelihood strategy (Martin, 2012; Punch, 2015). In spite of the growing importance in recent times of service sector and other non-farm employment, agriculture remains a central livelihood activity in most rural areas employing 48% of the working-age population in San Lorenzo, 74% in Uriondo and 19% across the Central Valley region as a whole (INE, 2012). While access to health, education, electricity, a paved road network and other basic services and amenities has increased in rural areas during recent decades (INE, 2011), 50.2% of the population of San Lorenzo and 56.1% of Uriondo live in poverty (INE 2012). Many households suffer high levels of food insecurity (Böhrt, 2009; Gallegos, 2012), and agriculture faces many challenges and limitations (Beck, Paniagua & Preston, 2001; Martin, 2012; Prefectura, 2006). Much of the existing research on livelihoods and environmental change in the Tarija Department and Central Valley focuses on livelihood strategies within the context of limited commercial opportunity, the role of migration, landscape degradation and food security concerns and is particularly focused on western highland and neighbouring valley areas further way from the zone of influence of the City of Tarija (e.g. Beck, Paniagua & Preston, 2001; Böhrt, 2009; Gallegos, 2012; Martin, 2012; Preston, 1998; Preston et al., 2003; Punch, 2015). We add to this body of work by shifting the vantage point of analysis to areas of the Central Valley where rural development investments, including irrigation and commercial agricultural production promotion, have been concentrated allowing us to examine the emergence of sub-regional specialisation in commodity production and agrobiodiversity. We draw on data gathered during twelve months of ethnographic fieldwork (in 2012 and 2013) on rural livelihoods, the local food system and the history of development interventions to document and analyse how household experiences and responses to globalised change have shaped uses of agrodiversity. A full description of methods used in the larger study is available in Turner (2016). Here we utilize semi-structured interviews on personal histories and experiences of change related with household food production, consumption and exchange. These were conducted with individuals and, when possible, multiple family members of different generations in 68 households in seven study communities selected through a transect sampling strategy (Figure 1). Seventy-seven per cent of households had three hectares of land or less and only 8% of households reported more than 10 hectares. San Lorenzo and Uriondo Transects, transect zones and a sub-group of 48 research participant households currently engaged in primary production activities. The transects, which were divided into zones to facilitate data gathering and analysis, allowed for sensitivity to possible differences related with distance and access to markets, urban centres and infrastructure. The San Lorenzo transect is approximately 11 km long (and a 30-minute drive/16 km north of the City of Tarija) and the Uriondo transect is 7.25 km long (35 minutes/26 km south of the City of Tarija). Both transects fall within the broad area of influence of the city and each emanate from a tertiary regional center situated on a main roadway connected with the city: Villa San Lorenzo with a population of ~3400 and Valle de la Concepción3 with ~1720 residents (Zone A of each transect: INE – Central, 2012; Prefectura, 2006). Both towns have many small shops and restaurants and are municipal capitals. Valle de la Concepción is also home to the National Viticulture Centre and over the last decade tourism has become an important part of the local economy, particularly connected with a wine tourism route and wine and grape harvest festivals and events. Tourism is also important in San Lorenzo, but tends to be linked with religious events, such as the Festival de San Lorenzo, Easter and other celebrations. Other zones correspond to the boundaries between the smaller communities along each route: Tarija Cancha Sud (population ~280) and La Calama (population ~439) in the San Lorenzo Transect, and La Compañía (population ~640) and Saladillo (population ~465: INE – Central, 2012). Zone D around the community of Marquiri (population ~95), San Lorenzo, was the most isolated. With the exception of Marquiri, the other communities were all located along paved roads, with frequent transportation to the City of Tarija. Several small shops are also present in each community. Most agricultural plots are situated along the roadways and rivers, sometimes with smaller, rain-fed agricultural plots on the hillsides away from the communities. While all interviews included historical components, 18 interviews focused primarily on life history and regional history. Many of the resulting narratives are of childhood memories of men and women now in their 50s to 80s. A purposive sampling strategy, aided by a referral sampling technique, identified households and individuals presently or formerly engaged in primary production activities and willing to participate (Biernacki & Waldorf, 1981; Palys, 2008). Local research assistants also helped identify participants and with data gathering. Study community household data are complemented by interviews with key informants in local non-governmental organisations (NGOs), government agencies and producer associations, and other producers in study and neighbouring communities (n = 41). All interviews were conducted in Spanish. We also conducted a review of government planning documents and an analysis of local climate data using linear regression analyses. Pseudonyms are used to protect research participants’ privacy and anonymity. This research was approved by the University of Manitoba (Winnipeg, Canada) Joint Research Ethics Board (Protocol #J2012:144). Agricultural production in different forms has underlain the Central Valley economy for millennia (Macklin et al., 2001; Prefectura, 2006).4 We focus here on agricultural production from the 1950s to the present, roughly corresponding to the living memory of the oldest research participants. 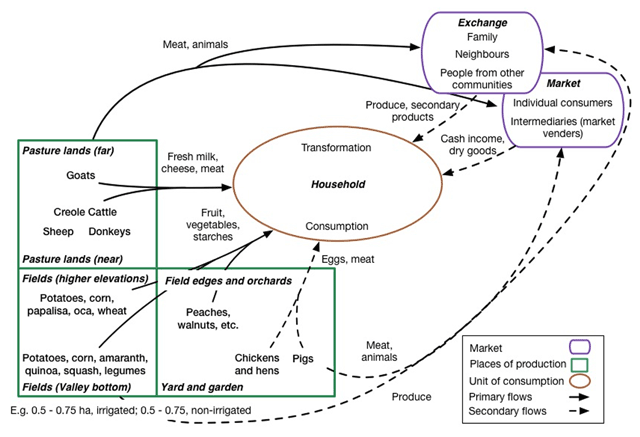 Participant narratives document a coarse pattern with respect to their household economic organization and production strategies over time, aligning with regional transformations in agriculture (Figure 2). Two distinct configurations of agricultural production are evident: 1) mixed agriculture based on rain-fed crops and pastured livestock, primarily for household consumption; and 2) production of regionally specialised commodity goods, such as milk, grapes or other commercial fruit and vegetables. A period of reorganization in which households began reorienting their economies towards commercial production began 30–40 years ago. Timeline of rural transformation in the Central Valley (based on CODETAR, 1979, 1991; Prefectura del Departamento de Tarija Secretaría de Planificación e Inversión, 2006; and interview data). Household food system (c. 1975), example from Tarija Cancha Sud (Andrea’s childhood household). [My father] always grew quinoa. He grew wheat, [and] amaranth also… It grew beautifully. We would grow it, cut it, dry it, thrash it. It was a lot of work, but it was so good… We would mill it and make tortillas… That is how it was years ago. […] My great grandmother had her garden with everything: apples, pears, peaches, figs, prickly pear cactus fruit. Crop production was limited to the rainy season and most households maintained multiple plots in different locations and elevations for greater crop diversity and to spread production risks (Figure 3). Uplands were also essential feeding areas for goats, sheep, cattle and donkeys, brought to different locations depending on season and forage and browse availability, practices also well documented in other locations in the Central Valley and surrounding areas by Preston (1998; Preston et al., 2003; 2016) and Vacaflores (2013). Children played a vital role in caring for pastured livestock. Andrea’s sentiment – ‘I was raised with the goats’ – was echoed by many older participants in both transect areas, remembering the responsibilities and hardships of this work. Regardless of the weather, children would often leave home with their animals in the morning, not returning until late afternoon: ‘If hail fell or what have you, we had to go look after them just the same. We had to cross many rivers so that they could go to eat.’ Pastured livestock also played an important role in sustaining agricultural production, supplying green fertilizers and bringing nutrients acquired through grazing natural pastures to fertilize cultivated plots. Corrals were used to stockpile dung that was then transferred to fields. Crops and livestock were key to household diets; however, campesino producers also sold or exchanged many primary and secondary products to cover household expenses or augment the diet.9 While some durable or processed foods were purchased or bartered for in the towns or at the Tarija market, other goods, such as fruit, cheese, salt and tubers, were exchanged among neighbours or households across communities. The late 1970s and early 1980s marked the beginning of a push for agricultural modernisation, and many households, including most research participant households (Section 3.3), began shifting their production towards government-prioritized agricultural commodities. During this period, government agencies, particularly the newly established Tarija Department Development Committee (later CODETAR),10 with aid from international donors and non-governmental organizations began implementing projects promoting sub-regional specialisation in economically profitable products with agro-industrial potential in accordance with the ‘development poles’ strategy being pursued by state development corporations country-wide (Avilés Irahola, 2005, p. 60; Plaza, Vargas, and Paz, 2003). [E]nsure the adequate supply of primary materials for agro-industries basic to the department (oil, grapes, sugar cane, wood, milk)…Expand the agricultural frontier, using better and more rational uses of land and water…[and] increase the production of stuffs with competitive advantage, whose destination is industrialisation or extra-regional export (CODETAR, 1979, p. 327). Accordingly, state officials selected specific crops and livestock for technical and financial investment (CODETAR, 1979, p. 329). In the Central Valley, they emphasized viticulture (particularly in Cercado and Uriondo) and dairy (in San Lorenzo), which were supported through multi-party initiatives (e.g., irrigation projects, production cooperatives and processing plants) to facilitate agricultural modernisation, growth and market integration (CODETAR, 1979, 1991; Tapia & Pimentel, 1978). The trajectory of commodity production and sub-regional specialisation begun in the 1970s and 1980s continued with strategic product promotion and production growth remaining economic priorities for the Central Valley through the 1990s to 2010s (Prefectura, 2006; FAUTAPO & OMIN, 2012a; Comité de Competitividad, n.d.). By 2012, 902 dairy producers were reported in the Tarija Department with dairy production rising to 10,497,000 L/year (Vásquez Mamani & Gallardo Aparicio, 2012, p. 159) from 1,600,000 L/year in the mid-1970s, when only 44 of 4,490 recorded head of cattle were breeds other than creole (Sanabria, 1974, p. 192). Similarly, by 2015 an estimated 3500 ha of land were dedicated to viticulture in the Central Valley (Asociación Nacional de Viticultores, cited in El Diario 2015, p. 1). Over this period, population in the Central Valley (San Lorenzo, Cercado and Uriondo municipalities) also increased from approximately 140,000 in 1992, to 190,000 in 2001 and 245,000 in 2012 (INE, 2015). Over recent decades, the population of Tarija has also shifted from being primarily rural to majority urban. In 1950 only 23.6% of the population lived in urban areas, but over subsequent decades that number has grown from 38.9% in 1976 to 54.7% in 1992, finally reaching 65% in 2012 (INE, 2015, p. 15). During this period many young people and adults from rural communities moved to the city seeking education and wage employment or went south to seek work in agricultural production in Argentina and plantations elsewhere in Bolivia. Seasonal and long-term migration over many decades have contributed to low population and availability of labour in rural areas in the Central Valley and provides a source of capital through remittances and the savings of those who have returned (Martin, 2012; Pizarro & Ryazantsev, 2016; Preston & Punch, 2001; Punch, 2007, 2015). Regional changes are echoed by profound changes in many rural households. As Andrea in a Tarija Cancha Sud summarized: ‘Now, pasturing is over, and they’ve bought cows and one dedicates oneself to the cows. 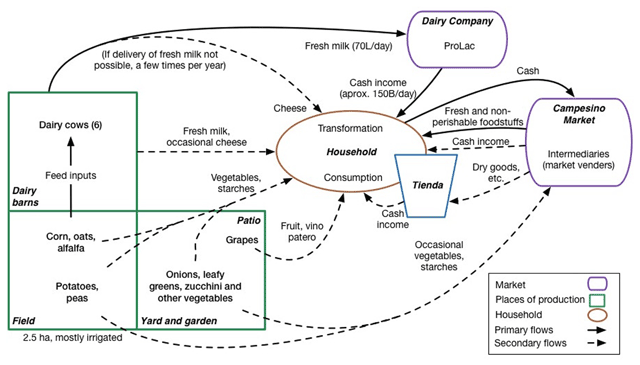 No one has goats here anymore.’ Figure 4 schematizes Andrea’s current household production system organised around commercial dairy production, in contrast to the primacy of non-commercial household food production in the 1970s (Figure 3). Although some food for household consumption is still produced, land and labour are dedicated mainly to commercial dairy production, with cash income from selling fresh milk used to purchase most food and other household needs. Other activities, such as a small shop (tienda), also provide a small supplementary income, as do some off-farm activities. Household food system, example from Tarija Cancha Sud (Andrea’s household c. 2013). Notes: Crop production refers to limited production of traditional agricultural products, such as field crops (e.g. corn, potatoes), vegetables (e.g. onions, tomatoes) and fruit trees (e.g. peaches). It is distinguished from specialised commercial production, which includes non-traditional fruits and vegetables (e.g. berries, asparagus) usually introduced during the late 1990s and 2000s. Viticulture refers to households involved in commercial grape production. In most cases, these households also produce other fruit and vegetables for market and household purposes. Dairy producing households (involved in commercial dairy production) also produced some or all of their livestock feed (e.g. corn, alfalfa). Agriculture with animal husbandry refers to households involved in mixed production, with pastured livestock playing a significant role alongside traditional crop production. While the outcomes of change processes in San Lorenzo and Uriondo communities are distinct (as reflected in regionally-specialised production strategies), strong similarities exist across the study communities with respect to practices, livestock breeds, and crop varieties that constituted past primary production systems and which of those elements have declined or disappeared from the current production landscape (Table 1). Reasons for changes in household primary production strategies and agrobiodiversity composition are examined below through the lens of pastured livestock (Section 4.1) and grain crops (4.2). In the case of goats, sheep and creole cattle, it is not only the number of households with these types of livestock that have declined (Table 1), but also the herd sizes (Table 2).15 Additionally the distribution of households with pastured livestock has shifted, with most now concentrated in Marquiri in contrast to formerly wider distribution (Figure 6). Numbers of goats, sheep and creole cattle owned by households currently and in the past. Historic and contemporary distribution of ancient grains (wheat, amaranth and quinoa) and pastured livestock (goats, sheep and creole cattle) among 48 primary production households. Although, for some, declines in pastured livestock are part of a broader reduction in primary production activities associated with ageing (approximately four of the interviewed households),16 most participants relate declines to other cumulative and mutually reinforcing factors connected with changing regional agricultural production and modernization patterns, environmental change and responses to shifting socio-cultural, economic and ecological contexts of the Central Valley (Table 3). Factors prompting reductions in pastured livestock. Changing land use and access Landscape change Higher density land occupation and commercial use (i.e. vineyards) restricted space for pastured livestock Increased conflict between livestock herders and commercial producers ‘There is very little common land now because there are lots of people now [and agricultural development]. On this side above here, there are vineyards…. And now also above – a little more above – there is the big vineyard. All of these hills, all of it is full of vineyards’ (Manuel, La Compañía). Enclosure of common lands Processes of land titling and development Less access to pasture lands ‘…before there was a lot of common land and people didn’t plant…so the common lands, it was there they pastured their livestock…[now] the owners have taken it and sold it… because of that today the neighbours don’t raise animals because they don’t have anywhere to do it, anywhere to pasture them’ (Alejandra, Saladillo). Establishment of ecological reserves Restricted access to highland pastures Fewer areas to pasture livestock ‘When the Sama Reserve was created they weren’t able to pasture their animals there any more, so that was another reason that they stopped having goats’ (Patricia, cheese maker and Tarija market vender). ‘Modern’ lifestyles, production methods, and household economies Changing lifestyle norms Children had to attend school Less family labour for livestock herding ‘Before they had their children that would look after them, but now… there is nobody’ (Emilia, La Calama). Lack of institutional support Incentives for other types of production (e.g. new livestock breeds) Increased opportunity cost of having pastured animals ‘There was nothing [for other livestock]. For the [dairy] cows there is. I don’t know why’ (Eva, Tarija Cancha Sud). Increased disease prevalence Increased production costs Less incentive to maintain herds ‘If they aren’t vaccinated 3 or 4 times a year, they get sick’ (Leticia, Marquiri). Higher opportunity costs Other activities (e.g. dairy, vineyards) became possible Land and labour became scarcer ‘So becoming a dairy producer has also given rise to the substitution of crops like corn and wheat that stopped being profitable [for other commodities]. So there has been substitution’ (Jose, Villa San Lorenzo). Landscape changes, particularly expansion of cultivated land, are linked to development programs facilitating irrigation network construction, improved transportation infrastructure and incentivising commercial production through new techniques (Section 3). As some households began to adopt new activities, other households were also affected by the transforming landscape around them. Certain activities, such as pasturing livestock, formerly the basis of the campesino economy and way of life, became more costly and thus progressively less desirable. You can’t because they plant here…Years ago it wasn’t cultivated, it wasn’t fixed up. It was all a single campo.17 Like that, with nothing and everyone had goats, sheep. Later we made the water infiltration gallery so now everything is irrigated – everything. That’s why it’s all green and we can’t have goats because they are very damaging and harmful to people. Because of that we have plenty of [dairy] cows. Here everyone does. It’s a dairy zone. It is all [dairy] cows, nothing more. Goats can easily escape from corrals and into cultivated fields eating whatever they find. ‘They finish everything,’ she explained, which causes disagreements among neighbours. Before it was communal, it was common, you could take a flock of sheep and put them up in the hills. All of the community would put everything in the hills to pasture them. And now they don’t allow you to put them in another community. We, the people from here, used to put them in the hills in front but now those hills belong to that community. That community has prohibited it. Preston and colleagues (2003) report that by 1984 many campesino communities in the Tarija Department highlands had decided to restrict access to their lands and that ties between highland and valley areas have weakened in recent decades. This led some Central Valley communities, such as those in the Camacho Valley (southwest of the Uriondo Transect), to respond to the changing land access conditions by reducing sheep herd size and increasing their numbers of cattle (also see Preston, 1998, 2016). The establishment of the Sama Ecological Reserve (Reserva Biológica de la Cordillera de Sama) in 1991, located in the municipalities of El Puente and Yunchará, was also identified as a factor limiting access to highland pastures necessary for healthy goat herds in the Central Valley. Narratives about the loss of land access echo others about labour scarcity and changes in social norms. Historically, child and family labour was vital to household production (Section 3.1). As children began attending school more regularly and social norms and expectations surrounding childhood changed, research participants in La Calama and elsewhere explain that the labour requirements for maintaining pastured livestock became harder to meet. Although not discussed extensively by research participants in relation to the re-orientation of household production systems away from pastured livestock, long-term and seasonal migration out of rural areas is a well-documented and prevalent regional phenomena (Section 3.3). Over a third (16) of the representatives of the 48 participating households (and eight other interviewed households in the study communities) had left the Central Valley at some time in their lives for employment reasons or had a close family member (a parent or child) who had. Undoubtedly, lower labour availability, sometimes coupled with access to wage earnings, has contributed to household decisions to shift to less labour intensive production strategies and the purchasing of more foodstuffs.20 Several research participant households began returning to the Central Valley in the early 2000s following the decline in the Argentinian economy and, with the capital and knowledge gained over years or decades abroad, began more capital intensive, commercial production activities, such as commercial dairy, viticulture and horticulture (also see 4.2.4). Changes in household dynamics came hand-in-hand with changes in consumption norms, as store-bought clothing, food, other household items and agricultural inputs became commonplace. Many older people reflected on a generational divide they feel with younger people, including their children and grandchildren, surrounding food preferences and eating habits. Discussing common foods from his childhood, Miguel in Saladillo reflected, ‘Those make them [young people] laugh. An api de leche21 is really good!’ These changes in preference and declining social status of traditional foods have also influenced household and regional market demand for them, consequently increasing the material, social, and opportunity costs of maintaining pastured livestock. Sheep wool and animal leathers have also been replaced in clothing and other goods by industrially made cloth and other purchased fibres, thus reducing the household use and market for non-meat livestock products (Martin, 2012). In the Central Valley, all campesinos know about livestock transhumance. That is to say, bringing cows to the forest or bringing the animals to the hills for a season. … [But] now, not everyone can do it because they have lost the legitimating support from the state … It’s normally the technicians who recommend to the campesinos that they stop doing this practice, that they should stay in one place, because it’s inefficient. That’s what’s happened in San Lorenzo: Transform their food producing area into an area to produce alfalfa to produce milk, whereby they’ll make money, and with that they’ll buy some food. Concepts of modernization and ‘rationalising’ production are evident in the government policy documents (CODETAR, 1974, 1979, 1991; Tapia and Pimentel, 1978) guiding current development programs that promote commercial dairy production and viticulture, as well as other high-value, ‘non-traditional’ fruits and vegetables (e.g. Comité de Competitividad, n.d.; FAUTAPO & OMIN, 2012a, 2012b). Changing cattle production norms (e.g. year-round stabling in place of transhumance practices and removal of calves from their mothers directly after birth), were identified as essential to establishing a modern dairy industry in Tarija (Rodriguez & Pimentel, 1978). This also required introducing new genetic stock (Holstein dairy cattle) and converting pasture and croplands to growing livestock feed. Many communities and households (e.g. 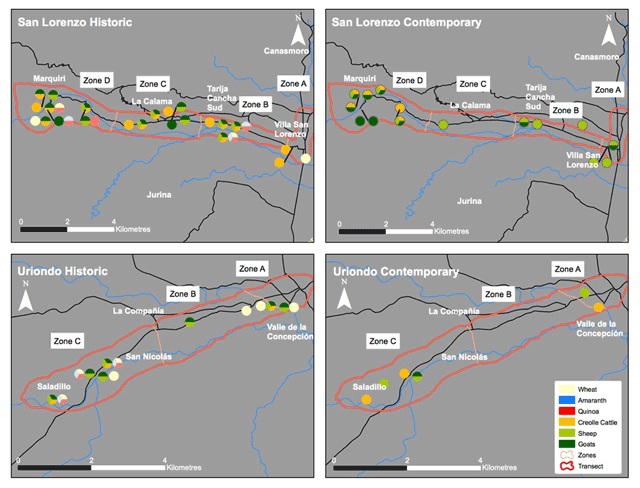 San Lorenzo Zones A–C) have adopted these production practices. Other research participants in La Calama and Marquiri similarly cited receiving support for their dairy cattle, but no, or very limited, support for their other livestock.23 Few could afford veterinary services for their other animals. As a related issue, some participants in Marquiri cited increased prevalence of disease, such as hoof-and-mouth disease (Aphthae epizooticae), within their herds as another factor increasing the difficulty and cost of maintaining pastured livestock. Martin (2012) also notes the role of livestock diseases and competition from imported beef from Argentina and Santa Cruz and industrial poultry barns begun in the Central Valley in the 1980s (CODETAR, 1979) as important factors limiting the viability of traditional livestock production practices in the Central Valley (also see section 4.2.3). …issues of the environment, the [ecological] reserves, the protections. They [campesino producers] have been made aware and many times they have eliminated the goats, thinking that they are predatory animals that deforest, that mess up the environment, causing erosion. And so, people have often been getting rid of these animals. Some research participants, including Pedro in La Compañía and Fátima in Tarija Cancha Sud, have internalized such discourses, identifying the harmful nature of goats, and to a lesser extent sheep, as reasons for changing their production strategies. Some also believed goats to be prohibited from irrigated areas because of their destructive behaviour (Field notes 06/15/2013). Pastured livestock declines are also linked with intersecting and oftentimes kindred processes influencing many households’ crop production portfolios (Table 1), including declines in the production of wheat, quinoa and amaranth (Table 4). Factors prompting changes in crop selection (e.g. abandonment of wheat, quinoa and amaranth). Production challenges and reliance on external inputs Increased prevalence of crop diseases Need to purchase agricultural inputs (pesticides) Increased costs of production ‘[In the past] it wasn’t necessary to treat anything. And now, how many treatments do you have to do to produce a harvest? You have to buy chemicals’ (Consuela, Saladillo). Changes in soil fertility and composition Need to purchase agricultural inputs (fertilizers) Increased costs of production; Changes in soil composition ‘It doesn’t produce… These lands don’t produce much… If you aren’t treating it with chemicals, it doesn’t produce anything’ (Catia, La Calama). Weather and climatic conditions Weather events Loss of harvest and seeds (e.g. quinoa and amaranth seeds were lost in Marquiri) Increased costs of production ‘It was a drought year, 1983. In that year it didn’t rain and, like that, we lost quinoa, amaranth, everything. After that year, we didn’t go back to planting it’ (Pablo, Marquiri). Availability and access to market-bought alternatives Availability of cheap imports Wheat from Argentina is cheaper Less demand for locally produced grains ‘The flour is from Argentina, right? … Everything, pretty much everything is from Argentina, right? It is brought from there’ (Ernesto, baker in Lajas). Increased cash income Greater ability to purchase food stuffs Substitution of household production for purchased food stuffs (e.g. rice and pasta) ‘They didn’t know how to buy. They grew… Now there aren’t beans, or fava beans, or wheat, nothing. Only what you can buy in Tarija’ (Alba, Marquiri). More frequent and faster motorised transportation Easier to purchase food stuffs Easier to transport goods to and from markets ‘It is more comfortable to bring it from the there [the Campesino Market in Tarija]…since my husband has a car, we buy from there for the week. It is easy for us’ (Gabriela, Villa San Lorenzo). New production technologies and infrastructure Introduction of more profitable breeds, varieties and crops Potential of production activities with higher returns Increased opportunity costs associated with use of space ‘We have seen that it [dairy production] gives better money, that it is better economically. It is more secure work, you could say, than producing potatoes or peas. [Dairy] cows are more secure’ (Huberto, La Calama). Local crops, like pastured livestock, are impacted by the particular land and labour requirements of commercial agriculture: ‘Now there isn’t wheat, everything is grass [forage] for the cows’ (Osana, Tarija Cancha Sud). With limited land, labour and water commercial agriculture imposes rising opportunity costs for traditional household crops. Desirability of traditional crops was also affected by a widely shared perception of increasing production difficulties. Many research participants said that crops are not as productive or reliable as in the past. ‘Now you can’t make it ripen,’ as Leticia in Marquiri explains, was a commonly expressed sentiment reflecting this experience. For years they grew wheat… All of these lands were wheat. But you had to look after it every day [because of birds]. … Now the birds don’t even leave the peas. If you plant peas, if you do it, they eat it. Using fertilizers, chemical pesticides, insecticides and fungicides raises production costs and creates dependence on external inputs, even for subsistence production. Research participants also believe that climatic conditions in the Central Valley have worsened in recent years with many reporting increased frequency and unpredictability of weather events. Using publicly available data gathered by the National Meteorological and Hydrological Service (Servicio Nacional de Meteorología e Hidrología) at their Tarija Airport weather station26 we analyzed change in over time in relation to: a) mean annual temperature, b) annual number of precipitation days and c) total annual precipitation. 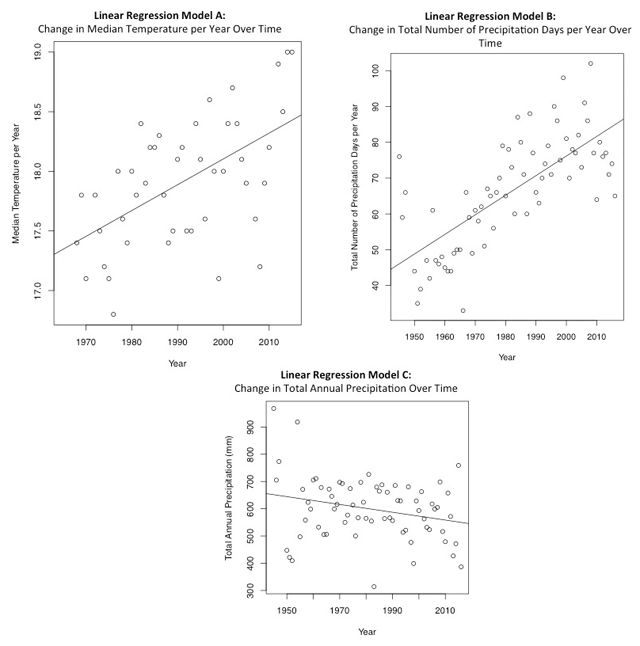 Our linear regression models (Figure 7a–c) showed that there were statistically significant changes for each variable. We found an increase in median yearly temperature of 1.02 degrees Celsius between 1968 and 2016 (Linear Regression a: df = 43, adjusted R-squared = 0.294, t = 4.396, p = 0.00007). We also found the total number of precipitation days per year increased by 38.85 days between 1945 and 2016 (Linear Regression b: df = 67, adjusted R-squared = 0.51, t = 8.488, p = 0.00007). Finally, we found a small but statistically significant decrease in total annual precipitation over time, with precipitation decreasing by 101.73 mm between 1945 and 2016 (Linear Regression c: df = 67, adjusted R-squared = 0.05, t = –2.177, p = 0.03).27 These findings are consistent with broader climatic trends in the Bolivian Andes and corroborate research participant accounts of changes they have observed in their local climate patterns. Linear regression models of change over time in mean annual temperature, annual number of precipitation days and total annual precipitation. Average maximum and minimum temperatures in the region between the northern Bolivian Altiplano and the valleys have increased between 0.8 and 1.5 degrees Celsius since the 1970s and the majority of weather stations in that region report a decline in annual rainfall since 1983 (Oxfam, 2009, p. 27: also see Solomon et al., 2009, p. 1707). Extreme weather events, including hail, drought, flood, frost and changing rain patterns have been recorded in Tarija in recent years (Fundación Tierra, 2012; Oxfam, 2009). Initial results from the 2013 national agricultural census show that fully 98.1% of Tarija Department communities suffered adverse climatic events between 2012 and 2013 (INE, 2014, p. 11). In agriculture sometimes there are years when a frost comes or a hail comes and it destroys the crops. We changed to dairy because we saw that dairy was better than agriculture… Dairy pays a little more money and with that we had enough to look after our children. In those years [when I was young] everything was different. That is to say, the change lies in the climate itself … in the season it rained a lot and everything was, almost enough: what we planted, what we grew. [Now] when it rains, it’s a cold rain. … Now hail falls and the earth takes the water. [Now] we are at the end of October and there isn’t water – zero [water] here…. By contrast in those years it would start to rain in August or September. What produced before were peaches, grapes, figs, plums, pears. Now those don’t produce much. That has been lost… Now when there is frost it doesn’t produce anything. There is very little peach now. And others get diseases. Hail, hail and [when] it falls, you can’t even eat [the fruit]. It is better to buy little apples from the market that they bring from other places. We are milling more corn than wheat… before they didn’t bring in flour from Argentina. Everything was what we grew here. Here we grew it, here we milled it, here we used it. … Now Argentinian flour comes in and more cows appeared. He remembered this shift beginning approximately 30 years ago, coinciding with increased dairy farming and fodder production. Availability of cheap imports, like Argentinian flour, coupled with improved transportation and more cash income, help make marketed foods more accessible and convenient, particularly for households in Villa San Lorenzo and Valle de la Concepción. Consuela in Saladillo explained, ‘Years ago we didn’t know how to use merchandise (mercaderia).’ Now, most participant households report buying all or most of their food. Motorised transportation and improved infrastructure have also increased access to markets and urban centres, making food purchasing more feasible for many households. Older people recall that travel from Villa San Lorenzo to Tarija took half a day; now it takes less than half an hour with transportation available every 15–20 minutes. During the late twentieth and early twenty-first centuries, government programs, NGOs, small groups and individuals worked to increase access to genetic stock from elsewhere in the world to enable agricultural modernisation. This included dairy cattle from Uruguay and grapevines and other seed stock from Argentina. These were often coupled with marketing and commercialisation support for strategic commercial crops. Programs, such as AFRUTAR (an agricultural cooperative active in San Lorenzo, late 1990s to late 2000s), also facilitated access to new species of fruits and vegetables – blackberries, raspberries, blueberries, asparagus – now under small-scale production in the Central Valley. Migration and immigration also facilitated the introduction and learning about new production technologies related to new crops (also see Section 4.1.2 and Martin, 2012; Preston, 2002). Many in the Central Valley, including many research participants, have worked in agriculture in Argentina, and by doing so gained capital to invest in dairy cattle and other primary production activities back in the Central Valley. Ana in Villa San Lorenzo explained, ‘[Many people] have gone to Argentina to work and come back… So they plant their lands with onions, peas, fava beans – big ones! – lettuces, Swiss chard, everything they brought. All the seeds are brought from Argentina.’ Some of the first commercial grape plants were also Argentinian. Before beginning strawberry production in La Calama, Wilber worked on strawberry farms in Argentina for several years. ‘I went to work there and learned,’ he explained, ‘then I tested it here on this little plot and it went well for me.’ Jaime, an agricultural development key informant and horticultural producer, recalled few vegetables other than carrots, beans and tomatoes in Tarija 30 years ago when he immigrated from Europe. He brought broccoli and other vegetable seeds with him that have since become commonplace in local markets and producers’ fields. [Before] we had little plots and grew seasonally when there was rain. …Working here [in Saladillo] with water, it was another thing. We decided to stay here and to grow in another way then. Doing it seasonally, is only one time. With irrigation, we plant until March… And then we rest. And start again in June. Conversely limited infrastructure is an underlying factor explaining the persistence of pastured livestock and rain-fed agricultural activities in Marquiri. Despite widespread changes in agricultural production and household economies, there are patterns of persistence in some elements of the historically important primary production system. Regionally, traditional agriculture and pastured livestock are still the basis of household production for some families, particularly those living beyond the valley floor (Field notes 10/23/2012, 10/26/2012; Martin, 2012; Preston, 1998, 2016; Vacaflores, 2013). Among the study communities, contemporary production patterns in Marquiri most closely resemble the historically prevalent production systems described by research participants across the transect zones. The reasons for persistence of pastured livestock and rain-fed agriculture in this zone likely relate with the areas’ comparative isolation and topographic conditions. The San Lorenzo transect overlays a sub-valley, which begins to narrow between La Calama and Marquiri. This limits the size of agricultural plots and requires terracing in the steepest slopes around the community. The limited potential for forage production, combined with an unpaved road between Marquiri and La Calama, which increases the functional distance to existing dairy collection stations and other limited infrastructure (e.g. irrigation networks and electricity to enable cold storage chains) restrict the viability of dairy production. In La Calama, which has only adopted dairy production in the last decade, dairy processing plants extending their daily collection networks to include the community was a key factor encouraging households to convert their production. Similarly, dairy production in other locations along the San Lorenzo Transect is made viable because of dairy collection centres and dairy collection routes, which are not available in Marquiri. While the patterns of persistence in Marquiri are the most striking, there is also a counter-current of persistence within other study communities related to: 1) relative compatibility or incompatibility among different productive elements within production systems; 2) continuity linked with transformation; and 3) production flexibility, adaptation and renewed interest in traditional crops. Among the study communities, contemporary goat production is almost exclusively limited to Marquiri. Small herds of sheep, however, have retained a slightly higher dispersion pattern elsewhere (Figure 6). Underlying this are different production requirements of the species, and thus different degrees of compatibility with market-oriented production systems. Xiomara in La Calama explained, ‘There isn’t space here… We have to have each thing in its place. The cows in their corral and the pigs in their pigsty.’ Others in Tarija Cancha Sud explained as well that unlike notoriously precocious goats, sheep transition more easily from pasture to corral management as necessitated by prevalence of cultivated fields and limited family labour (Section 4.1). The ability to ‘fit in’ to new production regimes has also supported persistence of some fruit and vegetable crops. Fruit trees continue to be produced around field edges, and some crops – potatoes, onions and other vegetables – are commonly planted alongside commercial grapes using the alleys between grape trellises and other open areas. This compatibility, albeit often at a small-scale, supports continuity of certain elements of the formerly dominant production system within a wider trend of transformation in primary production and household economies. High market value also supports continued production of some crops, such as peaches and potatoes, produced by households in La Compañia and Saladillo (also see Turner & Davidson-Hunt, 2016). In other cases, although certain species are still widely produced, or have grown in importance, changes have occurred with respect to varieties, breeds and landraces, their management and role within the household economy. New markets and regional prioritization of commercial viticulture and dairy production have shifted grapes and cattle from a position of ‘one among many’ within household economies to livelihood linchpins and drivers of the regional economy. Repositioning of these species as market-oriented commodities, however, has meant replacement of traditional landraces with more profitable, commercial strains. For example, although several dozen varieties of commercial grapes have been introduced to the Central Valley in recent decades (FAUTAPO, 2010) and viticulture production overall has proliferated, production of local creole varieties using traditional methods has declined.29 Likewise, creole cattle have been replaced in many dairy zones (e.g. San Lorenzo Zones A–C) by Holstein dairy cattle. Some campesino union and government agency key informants also report loss of local potato, corn and other crop varieties through replacement by commercial varieties. These examples of persistence underscore structural factors and producer agency in how processes of transition unfold. Many research participants report a high degree of flexibility and experimentation in their production systems over time. For example, one of the largest dairy producers in the Central Valley, the Estrella family in Villa San Lorenzo, had a commercial vineyard in the early 1990s and later on by the end of that decade a commercial strawberry field, before they began dairy production in the early 2000s on the same land. Other households in Valle de la Concepción, Villa San Lorenzo and elsewhere report similar shifts over time from vineyards to dairy or vice versa. This suggests that while landscape-level environmental change processes may shape the range of choices and possibilities available, households use their resources, knowledge and judgement to adapt their production within this range according to ‘what works’ for their needs and objectives, including adapting to climate change. Local governments, campesino unions, producer associations and NGOs also support dozens of production fairs across the Central Valley each year. Many research participants and key informants indicate that these events offer space for rural and urban residents to see, taste and access traditional and non-traditional agricultural products (Turner et al., 2016). Some fairs specifically highlight species and landrace diversity and associated traditional food products and facilitate seed exchange.31 In the future, particularly if local consumer demand for traditional products increases, this may further encourage reincorporating some of these within campesino production systems and household economies. Restructuring of household economies, agroecosystems and rural regions are processes underway in societies across the Andes and around the world (Bebbington, 2004; Oyarzun et al., 2013; Rhodes, 2006; Skarbø, 2006; Zimmerer, 1996). While the spatial and temporal complexity of such processes is increasingly recognized, more case studies documenting change in agrobiodiversity use in smallholder systems and associated rural transitions in specific contexts are needed to deepen understanding of how development pathways emerge and allow for, or limit, different ways of life, agricultural practices and uses of agrobiodiversity (Davidson-Hunt et al., 2016; Zimmerer, 2010). Such insights can aid in the decision making of rural households, campesino unions, state and other actors currently experiencing, planning for or responding to globalised change through the crafting of development pathways that improve the well-being of rural households and the environment. Here we present an empirical case study of changing agrobiodiversity compositions within household production systems during the living memory of research participants (c. 1950 to the present) in seven study communities. Research participant narratives document a widely experienced regional shift from rain-fed agriculture and pastured livestock production for household consumption to market-oriented production of regionally-specialised commodities. The shift in regional production patterns, however, was not a result of simple producer choice, but rather a convergence of multiple forces of globalisation, environmental change and historical legacies of past development interventions that came together to shift the landscape of possibilities towards commercial production. Over time this combination of factors has been widely effective in drawing campesino production into the logic and function of the state’s development vision through conversion (in whole or in part) of household economies to the production of agricultural commodities and agro-industrial inputs. While some traditional production for household consumption persists, in most cases it is now secondary to the role of commodity production and often at a reduced scale and under reorganised production conditions. Household experiences of these changes underscore the role of social and discursive power (Wolf, 1999) in establishing the primacy of modernist development trajectories within the local landscape; in doing so, elevating the interests of some (commercial and semi-commercial producers and agro-industrial actors) and marginalizing those of others (traditional producers) by transforming resource access and social conditions of production. The landscapes of possibility metaphor helps illustrate how, as a result of their distinct positions within a changing landscape, individuals may not have the same range of choices and responses to disruptions caused by globalised change available to them. Those who were able to opt into commercial production have experienced benefits including greater livelihood security and access to consumer goods than with subsistence production. Commercial dairy production and viticulture, although still considerable and continual work, are also often described as having made life easier and better, including for research participants’ children and grandchildren. Many appreciate the predictability (if punctuated by production risks) of dairy and grape production practices and income and associate greater market access and purchasing power with more diverse diets than in the past. Consequently, for some research participants, the elimination or reduction of pastured livestock, quinoa, amaranth and wheat from household production portfolios is linked with a sense of improvement in quality of life and opportunity and sometimes nostalgia for the past. For others, however, the adoption of new forms of production was not a freely made choice. Our research documents how through a convergence of multiple components of globalised change, livestock pasturing and grain production became progressively less viable livelihood strategies as local landscapes of possibilities shifted: pasture areas became less accessible, conflicts with commodity-producing neighbours increased and family labour was no longer available. These changes combined with other shocks and stresses, including increased competition with imports and commercially produced goods. For these producers, rural transformations and reconfigurations of agricultural production have led to a sense of declining self-determination over livelihood decisions that have been accompanied by a package of cultural change, including loss of access to valued foods that are now rejected by younger family members. A better understanding of how rural transformations unfold and are experienced by households and individuals is important in thinking about how to support campesino economies in Bolivia and elsewhere. In his original writing on landscapes of possibility, Bebbington (2008) makes the analogy between the range of choices different landscapes entail and Sen’s (1999) human-centred development approach that situates an expanded range of substantive choices for individuals to ‘lead the kind of lives they have reason to value’ (p. 10) as a central goal of development. Bebbington (p. 68) reflects, ‘The idea that many people’s livelihoods in the Andes are – under contemporary forms of capitalism – not viable, flies in the face of any such sense of freedom.’ Reflecting on how past transitions have occurred and the legacy of rural transitions can aid in the challenging task of considering how to craft sustainable, inclusive futures for rural communities and the role that agrobiodiversity might play within them. While decision making surrounding the retention or abandonment of agricultural practices and types of livestock and crops may ultimately be taken at the farm level, our analysis of the Central Valley’s rural transition process also demonstrates the important role that state and other actors play in creating the context, or landscape, in which such decisions take place. Part of the ongoing challenge facing the Bolivian State in supporting campesino economies will be to grapple with the contradictions and complexities surrounding rural transformations, including the often-times obfuscated tendency of planned development interventions and less-planned processes of change to create opportunities and benefits for some while restricting the range of livelihood choices available to others. Consequently, we conclude with several points of reflection for development policy and practice to support the creation and maintenance of enabling landscapes and further the Bolivian states’ commitment to supporting campesino economies. Firstly, research participant experiences underscore the complexity of local and extra-local factors shaping farm-level decision making around agrobiodiversity use. Our findings corroborate the observations also made by others (e.g. Skarbø, 2006; Zimmerer, 2010) that, although still sometimes posited as linear, near-universal, rural transitions and changes in agrobiodiversity use are seldom a uniform phenomenon resulting from single events or monolithic processes and thus cannot be addressed with a blueprint development policy. Rather, the interconnectivity among globalisation, environmental change and historical legacies and how they affect different elements of the local food system must be recognized and accounted for in rural development policy and practice if expanding livelihood options for smallholders and maintaining the potential for agrobiodiversity within the landscape are objectives. Furthermore, recognizing the role that global-scale factors, such as climatic events, changes in weather patterns and global market integration, outside the control of any one individual, household or group have on agrobiodiversity within household production systems highlights the importance of supporting local capacity to respond to these types of disruptions. Agrobiodiversity and traditional agricultural practices may play important roles in sustaining adaptive capacity (Davidson-Hunt et al., 2016). Historically prevalent compositions of agrobiodiversity and associated agricultural practices, however, are not currently being positioned within the landscape as viable livelihood options. Rather our findings show how investment flows and incentive/disincentive structures reflecting preferential support from state and non-state development actors for commodity production has negatively impacted the retention of traditional agrobiodiversity within household production portfolios. Action to address this imbalance through less sector-specific rural extension programs that could include a fairer allocation of subsidies to all rural producers, might help broaden the range of livelihood choices available to campesino producers in the Central Valley. In the case of livestock, some components of the historically prevalent production system, such as sheep and pigs, are more compatible than others, such as goats, with the requirements of smallholder agricultural systems prioritizing commercial production. Recognizing and promoting some of these synergies maybe effective ways for households to enhance their food security, supplement incomes and reduce dependence on external inputs by maintaining greater agrobiodiversity within their production portfolios (Turner & Davidson-Hunt, 2016). Related to this, we find that agricultural development in six of the seven study communities to date has largely been a story of smallholder intensification and specialisation in commodity production, particularly dairy and viticulture. Sustainable smallholder intensification is promoted by the FAO and development agencies as a rural development strategy with potential to address many challenges associated with rural economies and food production (FAO, 2013; Zimmerer et al., 2015). While on the surface, the intensification strategy promoted in the Central Valley appears successful, and the maintenance of smallholdings in rural areas is likely significantly better for campesino households than a shift to large private or corporate holdings (as has happened in parts of Cercado and elsewhere in Tarija), a deeper examination of different household experiences points to its limitations and costs. Importantly, the type of smallholder intensification promoted within Central Valley rural development policy has not focused on biodiversity-rich smallholdings, but rather on commodity production linked with specialisation and intensification of chemical and other capital-demanding inputs. These experiences indicate that the resulting landscape of possibilities produced by smallholder intensification is not a simple panacea for rural households and communities. In reality, it has contributed to a narrowing of development pathways in which some ways of life are rendered more viable than others. Reaching a critical mass of commodity production in both transects led incrementally to the enclosure of productive resources and landscape changes that limited traditional practices. With restricted access to resources, more households reoriented their production towards commercial products, in turn furthering community-level rural transition.32 This suggests the impacts of smallholder intensification should also be critically considered. Our findings also highlight the role of enclosures in limiting the viability of traditional agricultural practices and document how state policies supporting privatization of land holdings, particularly for the expansion of vineyards, protected areas and more recently collective titling of some campesino community lands has not paid enough attention to the use of commons lands in campesino livelihoods or the complex matrixes of access required for pasturing and transhumance practices. Our findings suggest that more attention should be paid to promoting collaboration among campesino communities as collective titling processes continue, as should greater attention within state planning and infrastructure development to transhumance corridors and thoroughfares. Such considerations are important in reflecting upon how to support campesino economies embedded in increasingly productivist landscapes by maintaining and re-establishing access to food producing resources. This case also highlights the role that state and other actors play in shaping attitudes towards agrobiodiversity, production practices and foods. While discourses of erosion and negative attitudes toward smaller ruminants has prompted the deactivation of historically dominant components of production systems, recent promotion of quinoa at the national and regional level and, to a lesser extent, amaranth and other crops demonstrates the importance of creating positive cultural associations surrounding foods and agrobiodiversity. This suggests that such efforts, including funding for campesino union designed public events, should continue and expand alongside changes in production-side rural development policy discussed above. Situating change in agrobiodiversity use within the experiences of research participants over many decades necessitates an analytical lens attuned to the complexity of endogenous and exogenous forces influencing regional development trajectories and the positionality of different households within them. Globalised change and landscapes of possibility provide such a lens to better understand how these processes unfold and to reflect upon how future rural development approaches may better work to create a broader range of substantive choices for smallholders, including possibilities for retaining aspects of historically prevalent production practices and associated agrobiodiversity. 1Household agrobiodiversity is the composition of individual species, breeds and landraces used within a household production portfolio. 2The term ‘creole’ is widely used in the study area to refer to local breeds and landraces and to distinguish them from modern varieties (Turner et al., 2016). This is distinct from other uses of creole, which tend to refer to processes of ‘creolization’ resulting from the mixing of traditional and modern crop and livestock varieties (Zimmerer, 2010, p. 151). 3The town of Valle de la Concepción is also sometimes referred to on maps and in some government documents as Uriondo; however, in keeping with the more common local usage and in order to avoid confusion with the Municipality, we use Valle de la Concepción. 4Prior periods of profound change in Central Valley agriculture include Spanish colonisation and associated introduction of European crops and livestock in the 1500s and, centuries later, the 1953 agrarian revolution and subsequent attempts in the 1990s and 2010s to complete the reform process, including the provision of collective land titles to campesino and indigenous communities (Stephan Beck, Paniagua & Preston, 2001; Kay & Urioste, 2007; Preston, 2016). 5All materials in Spanish, including documents and interviews, are translated to English by the authors. 6Central Valley totals are calculated based on the figures provided for the provinces of Aviles, Cercado and Mendez, as no municipal-level data is available. 7Ulupica (Capsicum eximium) is a very spicy, semi-wild, tiny round pepper. 8See Vacaflores (2013) for detailed descriptions of transhumance practices in Cercado. Also see Preston (1998, 2016) and Preston et al. (2003) for overviews of grazing and pasture activities in the highland areas of the Tarija Department. 9These included: eggs, meat, fruit and vegetables, and secondary products such as wheat flour, cheeses, bread, other baked goods and dried fruit. 10The Comité Departamental de Desarrollo de Tarija (Tarija Department Development Committee) was established in 1971 (Arze Cuadros, 2002, p. 307), and became the Corporación Regional de Desarrollo de Tarija (CODETAR: Regional Development Corporation of Tarija) in 1978 with the mission of promoting economic and social development with agricultural production as a strategic priority (Prefectura, 2006). 11A third national agricultural census (The First Agricultural Census of the Plurinational State: El Primer Censo Agropecuario del Estado Plurinacional) was conducted in 2013; however, the results were not publically available at the time of writing. No other comprehensive, current regional data are available. 12These include secondary production, food services, retail or other occupations such as teacher, office or construction worker and transportation services. 13Remaining households not engaged in commercial production (n = 5) had limited their agricultural and other economic activities due to mobility and other age-related challenges. 14Notes: Table 1 shows changes in occurrence of some types of crops and livestock within households’ production systems based on 43 of 48 households who commented on crops and livestock produced by their families in the past. Data were based on free listing, rather than exhaustive identification of all historic production activities of a given family. These general trends were also corroborated by research participants and key informants outside the primary production households included in Table 1. 15Non-primary production households also corroborated this subtler trend. Pablo’s household in Marquiri, with 10 goats and one cow, had up to 70 goats in the past. Similarly Consuela in Saladillo now has only chickens, but in the past had 40–50 goats, and when she was young her father had 70 goats and 55 sheep. 16This sub-group of households is distinguished from others in which household agricultural activities have been taken over or are transitioning to the management of a younger generation as elder members of the household became less active. 17Campo translates to countryside (non-urban areas) and is also used to describe uncultivated lands, including pastures, meadows or fields. 19Land clearing is also limiting availability of wild species [e.g. taco (Prosopis julifloras), chañar (Geoffroea decorticans) and tusca (Acacia aromo)]. Several research participants mention trees being cut down that they used to harvest for fruit. 20Work by Preston (2002) and Punch (2007) also documents the emergence and characteristics of migrant identities in Tarija. 21A preparation of cornmeal porridge, often made with goat’s milk and salt. 22Most of these supports are through the Departmental Agricultural Service (Servicio Departamental Agropecuario, known as SEDAG). Some producers have also received support through PROSOL, which redirects revenues from oil and gas development to campesino organizations for investment in agricultural development activities (Vacaflores, 2012). 23During interviews, key informants with local governments and state agencies discussed some of the programs that are available to support creole livestock, including veterinary services and genetic improvement initiatives; however, these do not seem to be widely known or accessed by research participants. 24See Preston (2016) for a detailed analysis of the role of erosion discourse in Central Valley environmental and development policy. 25A truckload of goat manure cost approximately 5000Bs (around 700 USD) at the time of research. 26This database can be accessed through the Service’s website: http://www.senamhi.gob.bo/sismet/index.php. 27Although change in total annual precipitation is statistically significant, the low R-squared suggests change in precipitation days per year is a more important variable. 28For further discussion on the limits of agricultural production in other parts of Tarija see Gallegos (2012), Martin (2012), Ministerio de Desarrollo (2004) and Preston and Punch (2001). 29A notable exception is Moscatel de Alejandía, an old grape variety, accounting for 42% of the area under grape production (FAUTAPO, 2010, p. 14). 31While some fairs focus explicitly on traditional crops, livestock and related products, others promote new forms of production and modernist ideals of efficiency. For example, an annual fair in El Rancho, just south of Villa San Lorenzo, celebrates the growth of the local dairy industry through prizes for the highest producing Holstein dairy cows, among similar competitions (Field notes 05/05/2013, 05/15/2013). 32The role of such tipping points in perpetuating the consolidation of agricultural intensification as a dominant regional development pathway has also been documented by Zimmerer, Carney and Vanek (2015). We would like to thank the research collaborators, key informants, JAINA – Comunidad de Estudios, RIMISP – Centro Latinoamericano para el Desarrollo Rural, Asociación de Turismo de San Lorenzo, Gobernación Sub-Sección San Lorenzo and the other organizations and individuals who made this research possible. Our thanks to Julián Idrobo, Jim Handy and the anonymous reviewers for their comments and helpful suggestions on this paper. We are also very grateful to Sarah Turner and Damon Matthews for their assistance with climate data analysis and Justin Geisheimer for his help producing Figures 1 and 6. We are also grateful to Fidelia Romero Lopez, Leonela Valdez, and Marina Pastrana for their collaboration, patience and many insights and helpful suggestions during data gathering. Any errors are our own. This study was funded by Social Sciences and Humanities Research Council of Canada (research grants to Dr. Davidson-Hunt: SSHRC 410-2010-1818 and 890-2011-0113; and, SSHRC Joseph-Armand Bombardier Canada Graduate Scholarship, Doctoral Scholarship to Katherine Turner: 767-2011-0128), and the Canadian International Development Agency and Association of Universities and Colleges of Canada’s Students for Development Program (Individual Internship Award to Katherine Turner). Akram-Lodhi, A. H. and Kay, C. (2009). Peasants and Globalization: Political Economy, Rural Transformation and the Agrarian Question. New York, New York: Routledge. Arze Cuadros, E. (2002). Bolivia, el programa del MNR y la revolución nacional: del movimiento de reforma universtaria al ocaso del modelo neoliberal (1928–2002). Bolivia: Plural editores. Avilés Irahola, D. L. (2005). Popular Participation, Decentralization, and Power Relations Bolivia. Frankfurt: Cuvillier Verlag Gottingen. Beck, S., Paniagua, N. and Preston, D. eds. (2001). Historia, ambiente y sociedad en Tarija, Bolivia. La Paz, Bolivia: Instituto de Ecología, Universidad Mayor de San Andrés and School of Geography, University of Leeds. Biernacki, P. and Waldorf, D. (1981). Snowball sampling: Problems and techniques of chain referral sampling. Sociological Methods and Research 10: 141–163. Böhrt, J. P. (2009). Género, estrategias productivas y alimentación. La Paz, Bolivia: Fundación TIERRA. Brown, M. and Stem, C. (2006). Case Studies of Watershed Valuation in Bolivia, Ecuador, Guatemala, Honduras and Mexico (Case Study). The Nature Conservancy, p. 184. Retrieved from: www.FOSonline.org. Comité de Competitividad Cadena Uva, Vinos y Singani (2009). Plan Estratégico 2009–2013: “Cadena Uvas, Vinos y Singani.”. Ministerio de Desarrollo Productivo y Economía Plural, Estado Plurinacional de Bolivia. Retrieved from: http://www.encuentroproductivo.com/ep/pub/doc/doc30.pdf. Corporación Regional de Desarrollo de Tarija (CODETAR) (1974). Desarrollo económico y social de la region de Tarija: Ensayo de planificacion regional. Tarija, Bolivia: Corporación Regional de Desarrollo de Tarija (CODETAR), p. 375. Corporación Regional de Desarrollo de Tarija (CODETAR) (1979). Plan regional de desarrollo económico y social del Tarija (1979–1983). Tarija, Bolivia: Corporación Regional de Desarrollo de Tarija (CODETAR), p. 403. Corporación Regional de Desarrollo de Tarija (CODETAR) (1991). Lineamientos de política agropecuaria departamental. Tarija, Bolivia: Corporación Regional de Desarrollo de Tarija (CODETAR), p. 107. Davidson-Hunt, I. J., Idrobo, C. J. and Turner, K. L. (2017). The creativity of everyday life in crafting resilient rural food systems: An example from the Atlantic Forest Coast of Brazil. Human Ecology, (In Press). El Diario (2015). Productores piden construcción de cámara para conservar uva In: El Diari Nacional, La Paz, Bolivia: May 3 2015: 2. FAO (2013). International Year of Family Farming 2014 Master Plan (final version). FAO. Retrieved from: http://www.fao.org/fileadmin/user_upload/iyff/docs/Final_Master_Plan_IYFF_2014_30-05.pdf. FAUTAPO (2010). Catastro vitícola de los valles del sur de Boliva. Tarija, Bolivia: Fundación FAUTAPO – Educación para el Desarrollo, Programa de Fortalecimiento al Complejo de Uvas, Vinos y Singanis (PFCUVS). FAUTAPO & OMIN (2012a). Construcción y Posicionamiento de la Marca Tarija Aromas y Sabores: Guía Práctica. Tarija, Bolivia: Fondo Multilateral de inversiones (FOMIN) and Fundación FAUTAPO – Educación para el desarrollo. FAUTAPO & OMIN (2012b). Memoria Institucional, Integrando Visiones…Creando Futuro: Programa de Competitividad de las Cadenas Agroalimentarias del Valle Central de Tarija. Tarija, Bolivia: Fondo Multilateral de inversiones (FOMIN) and Fundación FAUTAPO – Educación para el desarrollo. Fundación Tierra (2012). Cambio climático seca de apoco las fuentes de agua en San Lorenzo [Homepage]. March 29 2012 Retrieved from: www.ftierra.org/ft/index.php?option=com_content&view=article&id=9439:rair&catid=172:recursos-naturales&Itemid=243. Gallegos, F. D. (2012). Food Security and Food Sovereignty in Tarija- Bolivia: Public Policy Opportunities and Challenges in Rural Communities (Master of Public Policy). Burnaby, B.C. : Simon Fraser University. Retrieved from: http://summit.sfu.ca/item/12475. INE (2011). Estadísticas socioeconómicas del departamento de Tarija. La Paz, Bolivia: Instituto Nacional de Estadística, Actualidad Estadística Departamental, p. 33. INE (2015). Características de la Población. Estado Plurinacional de Bolivia: Instituto Nacional de Estadística. INE – Central (2012). Censo de poblacion y vivienda 2012: Población, vivienda y área, según departamento, provincia, municipio, ciudad/comunidad y localidad. La Paz, Bolivia: Instituto Nacional de Estadística. Instituto Nacional De Estadística (INE) (2012). Ficha resúmen censo población y vivienda 2012 In: Instituto Nacional De Estadística (INE). Instituto Nacional De Estadística (INE) (2014). Un pincelazo a las estadísticas con base a datos de censos: Censo nacional agropecuario 2013, Estabo Plurinacional de Bolivia: : 14. Retrieved from: http://www.fao.org/fileadmin/templates/ess/ess_test_folder/World_Census_Agriculture/Country_info_2010/Reports/Reports_5/BOL_SPA_REP_2013.pdf. Instituto Nacional De Estadística (INE) (2015). Government website and database [Database]. Retrieved from: http://www.ine.gob.bo/default.aspx. Kay, C. and Urioste, M. (2007). Bolivia’s unfinished agrarian reform: rural poverty and development policies In: Akram-Lodhi, A. H., Borras, S. M. Jr. and Kay, C. eds. Land, Poverty and Livelihoods in an Era of Globalization: Perspectives from Developing and Transition Countries. New York: Routledge, pp. 41–79. Macklin, M. G., Maas, G., Warburton, J., Woodward, J. C., Meldrum, E. and Preston, D. (2001). Una historia de la formacion de los paisajes de Tarija In: Beck, S., Paniagua, N. and Preston, D. eds. Historia, Ambiente y Sociedad en Tarija, Bolivia. La Paz, Bolivia: Instituto de Ecología, pp. 1–7. Martin, C. (2012). 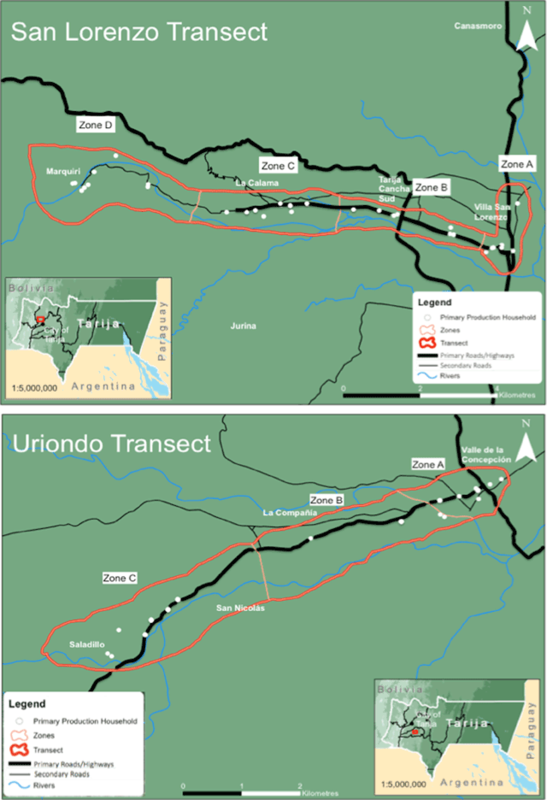 CONICET – IRD Migración en el Sur boliviano: Contrastes entre valles andinos tradicionales y áreas orientales de colonización, HAL online: CONICET – IRD. Retrieved from: https://hal.archives-ouvertes.fr/hal-00844591. Ministerio de Asuntos Campesinos y Agropecuarios (MACA), Instituto Nacional De Estadística (INE) & Organización De Las Naciones Unidas Para La Agricultura y La Alimentación (FAO) (2009). I Censo Agropecuario de 1950: Versión reeditada y digitalizada por la Fundación TIERRA. La Paz, Bolivia: Fundación TIERRA. Ministerio de Desarrollo sostenible Prefectura del Departamento de Tarija Unidad de Ordenamiento Territorial, & Oficina Técnica Nacional de los Rios Pilcomayo Y Bermejo Programa Estratégico de Acción para la Cuenca Binacional del Río Bermejo (2004). Plan Departamental de Ordenamiento Territorial Tarija: TARIJA 2005–2025, Unidad Territorial Valle Central (Programa Estratégico de Acción para la Cuenca Binacional del Río Bermejo). Tarija, Bolivia: Ministerio de Desarrollo sostenible Prefectura del Departamento de Tarija, pp. 1–22. Retrieved from: http://unicesar.ambientalex.info/infoCT/Plandepartamenltalbol.pdf. Oxfam International (2009). Bolivia: Cambio climático, pobreza y adaptación. La Paz, Bolivia: Oxfam Internacional. Retrieved from: https://www.oxfam.org/es/informes/bolivia-cambio-climatico-pobreza-y-adaptacion. Palys, T. (2008). Purposive sampling In: Given, L. M. ed. The Sage Encyclopedia of Qualitative Research Methods. Thousand Oaks, CA: Sage, 2pp. 697–698. Pizarro, C. and Ryazantsev, S. (2016). Trajectories and lives of labor migrants in perspective: From Bolivia to Argentina and from Tajikstan to the Russian Federation In: Pizarro, C. ed. Bolivian labor immigrants’ experiences in Argentina. Maryland, USA: Lexington Books, pp. 125–138. Plaza, D. S. L., Vargas, G. X. and Paz, R. A. (2003). Tarija en los imaginarios urbanos. La Paz, Bolivia: Fundación PIEB. Plurinational Legislative Assembly (2012). Framework law of Mother Earth and integral development for living well, Pub. L. No. 300, Plurinational Legislative Assembly of the Plurinational State of Bolivia. Retrieved from: http://www.biocultura.com.bo/recursos/leyes/71-ley-marco-de-la-madre-tierra. Plurinational Legislative Assembly (2013). Ley de organizaciones económicas campesinas, indígena originarias – OECAS y de organizaciones económicas comunitarias – OECOM para la integración de la agricultura familiar sustentable y la soberanía alimentaria, Pub. L. No. 338 (Decreto supremo n. 3453). Retrieved from: http://cipca.org.bo/index.php/documentos/presentaciones-eventos/leyes-y-decretos-supremos/leyes/ley-no-338-ley-de-oecas-y-oecom/download. Plurinational State of Bolivia (2015). Bolivia (Plurinational State of)’s Constitution of 2009 In: Max Planck Institute Oxford University Press. Retrieved from: https://www.constituteproject.org/constitution/Bolivia_2009.pdf. Prefectura del Departamento de Tarija Secretaría de Planificación e Inversión (2006). Plan Departamental de Ordenamiento Territorial Tarija 2006–2025 (Programa estrategico de acción para la cuenca binacional del Río Bermejo). Tarija, Bolivia: Prefectura del Departamento de Tarija Secretaría de Planificación e Inversión, p. 320. Preston, D. (2002). Identity and migration: Tarijeños and the Argentina experience In: Globalization and Mobility of Capital and Labour in Rural Latin America. Amsterdam: School of Geography, University of Leeds, pp. 35–42. Preston, D. and Punch, S. (2001). Estrategias de vida del hogar, sistemas de producción y medio ambiente: El Valle Camacho, Bolivia In: Beck, S., Paniagua, N. and Preston, D. eds. Historia, ambiente y sociedad en Tarija, Bolivia. La Paz, Bolivia: Instituto de Ecología, pp. 95–122. República de Bolivia, Instituto Nacional de Estadística (1990). II Censo Agropecuario de 1984: Resultados departamentales; Versión reeditada y digitalizada por la Fundación TIERRA. La Paz, Bolivia: Fundación TIERRA. Rhodes, R. E. ed. (2006). Development with Identity: Community, culture and sustainability in the Andes. Oxfordshire, UK: CABI Publishing. Rodriguez, N. and Pimentel, M. (1978). Descripción de las diferentes unidades ganaderas en el departamento de Tarija In: Tapia, M. E. and Pimentel, M. eds. Fomento de la producción lechera en Tarija. Tarija, Bolivia: MACA, CBF, CODETAR and IICA, pp. 11–20. Sanabria, L. O. (1974). Produccion de leche en los valles de Cochabamba y Tarija. Presented at the II Reunion Nacional de Investigacion en Ganaderia. IICA Zona AndinaEstación Experimental de Chipiriri: 191–194. SERNAP (n.d.). Reserva Biológica de la Cordillera de SAMA, Retrieved from: http://www.sernap.gob.bo/images/descargas/areas/reserva%20biolgica%20de%20la%20cordillera%20de%20sama.pdf. Smale, M. (2006). Valuing Crop Biodiversity: On-farm Genetic Resources and Economic Change. Cambridge, MA: CABI Publishing. Turner, K. L. (2016). Feeding Local Economies: Bolivia’s Edible Biocultural Heritage and Rural Territorial Development (Doctor of Philosophy). Winnipeg, MB: University of Manitoba. Retrieved from: http://hdl.handle.net/1993/31954. Turner, K. L., Davidson-Hunt, I. J., Desmarais, A. A. and Hudson, I. (2016). Creole chickens and ranga-ranga: Campesino approaches to biocultural resource-based development strategies in the Central Valley of Tarija, Bolivia. Agriculture 6(41): 1–33. Vacaflores, C. (2012). El programa de transferencias directas a las comunidades campesinas e indígenas PROSOL. Diversitas: Observatorio de La Plurinacionalidad Y El Comunitario 1(3): 1–8. van der Ploeg, J. D. (2008). The New Peasantries: Struggles for Autonomy and Sustainability in an Era of Empire and Globalization. London, UK: Earthscan. Wolf, E. (1982). Europe and the People without History. Berkeley, California: University of California Press. Wolf, E. (1999). Envisioning Power: Ideologies of Dominance and Power. California: University of California Press.